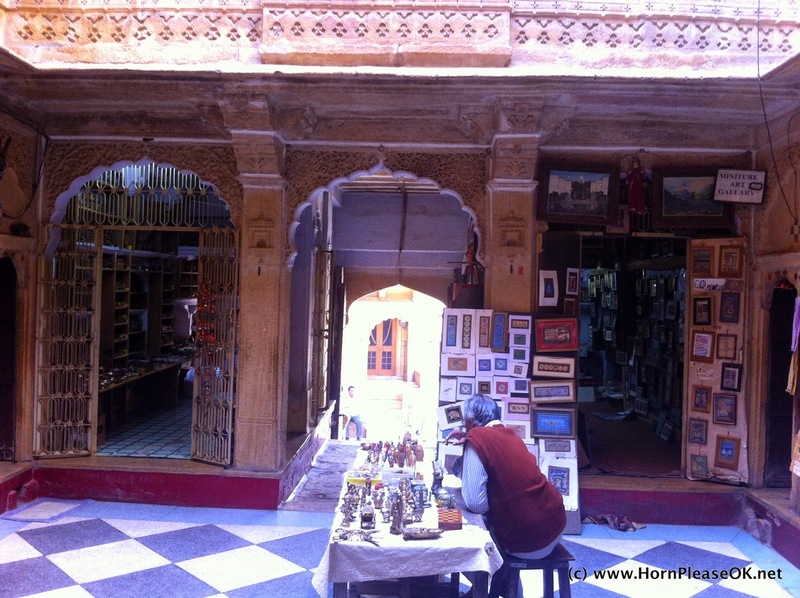 Rajasthan : Sam Sand Dunes to Jaisalmer | Horn please, OK? What do we like most about road trips? The unexpected discoveries along the way. Sam Sands is great for a been-there-done-that kind of visit. It lets you check something off your list but its too mainstream for anyone with an adventure seeking soul. The comfort of knowing that you're not alone in a wild, barren dessert is at odds with the thrill of being the only living thing as far as eye can see. Though there's nothing wild about Sam Sands. Its a jumble of people, camels, touts, swirling clouds of sand in the wake of jeeps, hawkers selling beer and chips, broken glass bottles and noise. We had been looking forward to an unbroken expanse of unspoilt dunes and were feeling a little let down. The desert camp suggested a jeep safari which sounded equally touristy so we ventured out on our own. There's just one road to follow to go deeper into the desert - the Jaisalmer Dhanana highway via Sam. Dhanana is a town next to the India Pakistan border and is not known for anything in particular except maybe a border outpost. We passed a village on the way and attracted a few curious stares. The only other cars on the road were tourist jeeps. A few kms later we came across our first cluster of sand dunes. They were far from the road so we drove on. The landscape up to the horizon was flat and barren interspersed with scrubs. Moments later we spotted these. The road was deserted (in a desert, hah!). We stepped out of the car to take pictures and its mirage like quality drew us towards it. A hundred metres from the edge of the road stood the first dune. We clambered up to see what was beyond. It was the desert we were looking for. The sun glinted off the sand while a lazy breeze created ripples at our feet. The sand was softer than powder and our feet sank a few inches with every step. Despite the light breeze there was a stillness around us like we existed in a bubble, part of a mirage made real by our imagination. 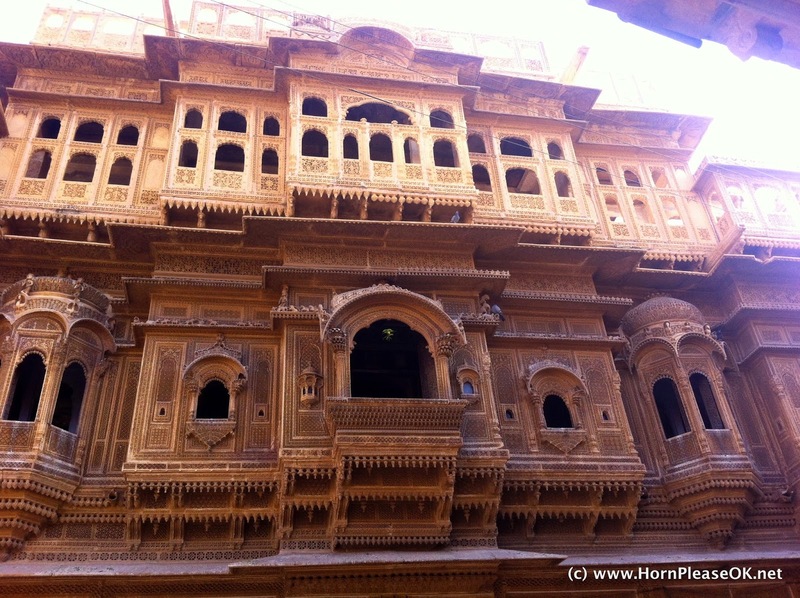 The day was getting warmer and we had a few more stops planned before Jaisalmer. It took us a while to shake the sand out of our hair and clothes and we headed to Kuldhara. Kuldhara is a village 35 kms away from Sam Sands, towards Jaisalmer. 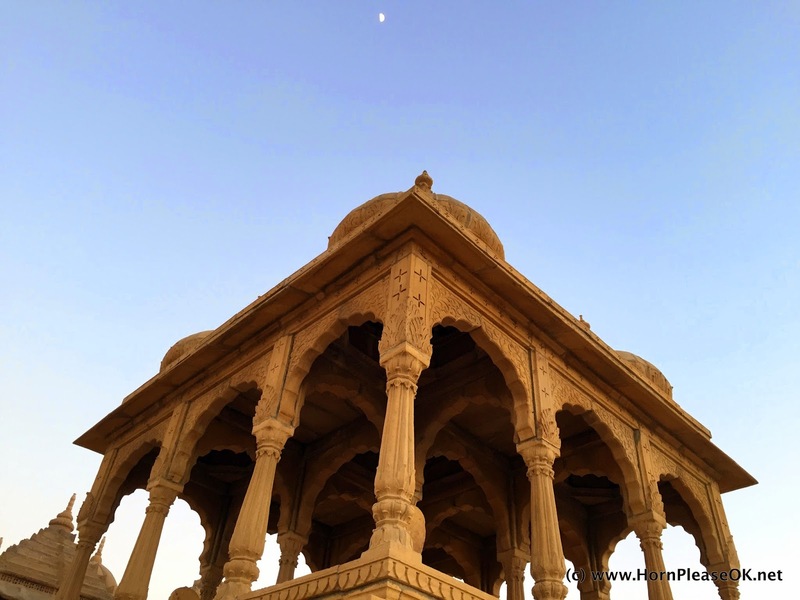 We drove down the Jaisalmer - Dhanana highway and turned off on the right towards Moolsagar. The village was made famous by a story about the mysterious disappearance of its inhabitants. A prosperous town of Paliwal Brahmins, Kuldhara was part of the kingdom of Marwar. Story goes that Salam Singh, a minister at the royal court and someone often described as debauched and corrupt, had his eye on a girl in the village. He demanded to marry her and threatened the villagers with dire consequences if they failed to hand over the girl. Rather than give in to the tyrant's demands the villagers decided to abandon the village. The old and infirm were said to have consumed poison and jumped into a well while the men, women and children from 83 surrounding villages packed up and vanished overnight. It is believed that the villagers put a curse on Kuldhara making it unfit for anyone to inhabit again. The village has remained a ghost town for the last 300 years. As with folklore there are many versions of this story. According to one of them the spurned Salam Singh raised taxes so high that the villagers had no option but to leave. Another one claims that a battle broke out between the villagers and Salam Singh's men, which led to the village being abandoned. Whichever version you choose to believe, a visit to Kuldhara will leave you feeling just a little bit spooked. 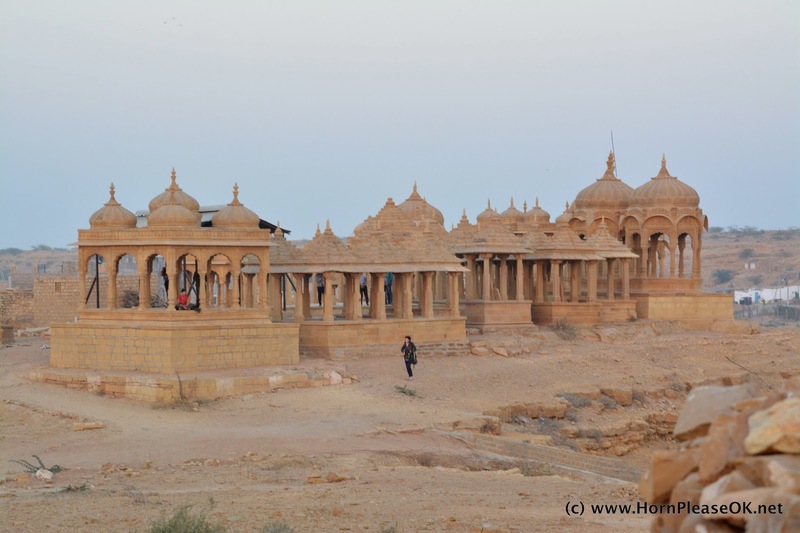 Jaisalmer is a half hour drive (18 km) from Kuldhara. We entered the city at lunchtime and stopped for a meal at The Trio which offers good food, a reasonable view of the fort and a clean toilet. 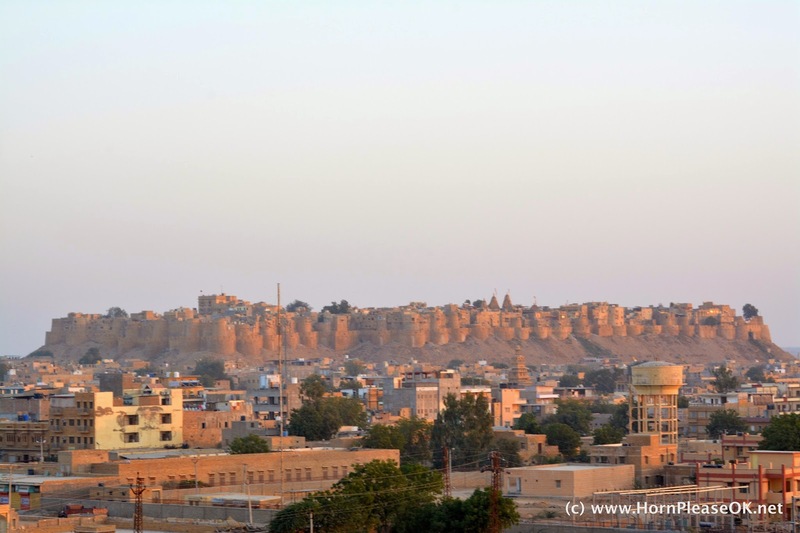 The town of Jaisalmer is famous for the Golden Fort or Sonar Quila and is little more than a village. Everything we'd read about it made us picture a magical town perpetually bathed in a golden light. Reality though was a little underwhelming. Jaisalmer was the entry point to India on trade routes originating from Central Asia making it an important destination for caravans. The town prospered during the reign of the Mughals and reached its peak around the 17th century. 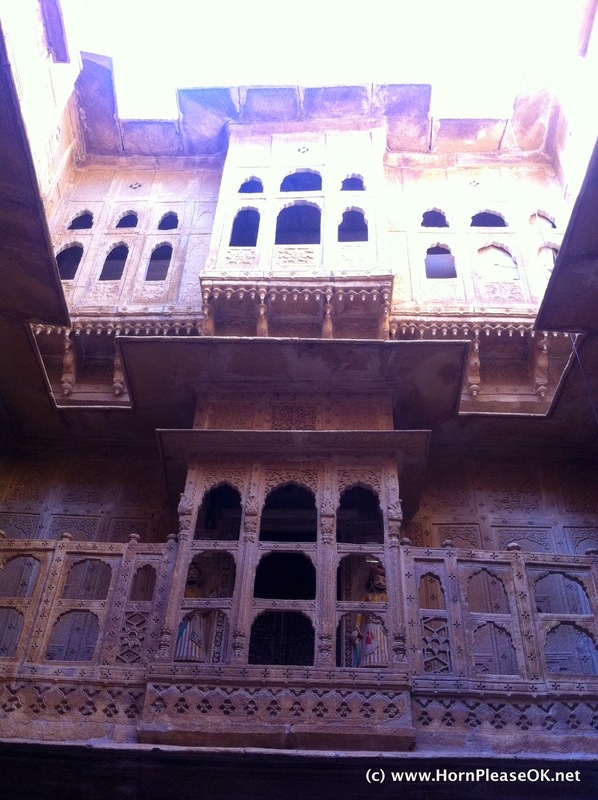 Rich merchants built beautiful havelis and became patrons of art. Most of these havelis lie just outside the fort walls in narrow maze like lanes. 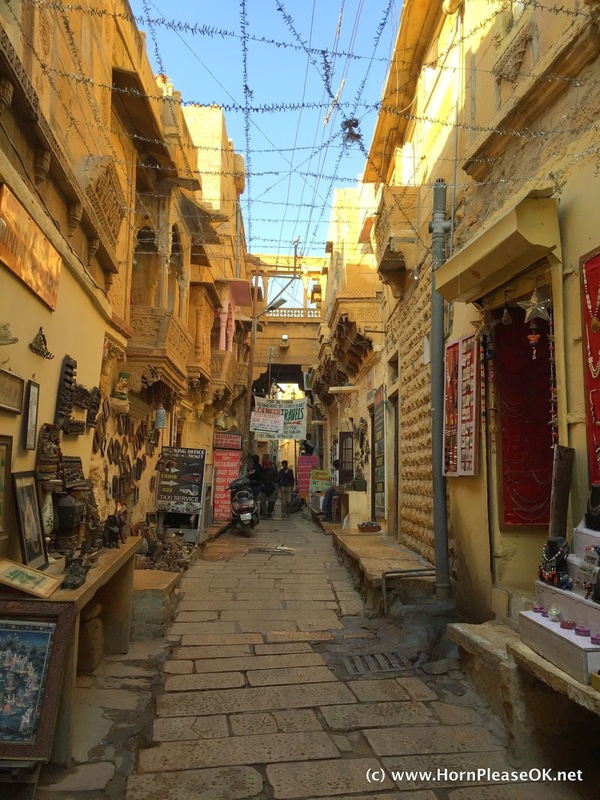 We parked our car in a public lot near Gandhi Chowk and explored Jaisalmer's lanes on foot. The houses were a mix of old and new, tasteful and tacky all made of the same yellow sandstone. This we learnt was a government mandate presumably passed to ensure that Jaisalmer holds on to its moniker of the 'Golden City'. Merchants who traded in pearls were traditionally called Patwas. 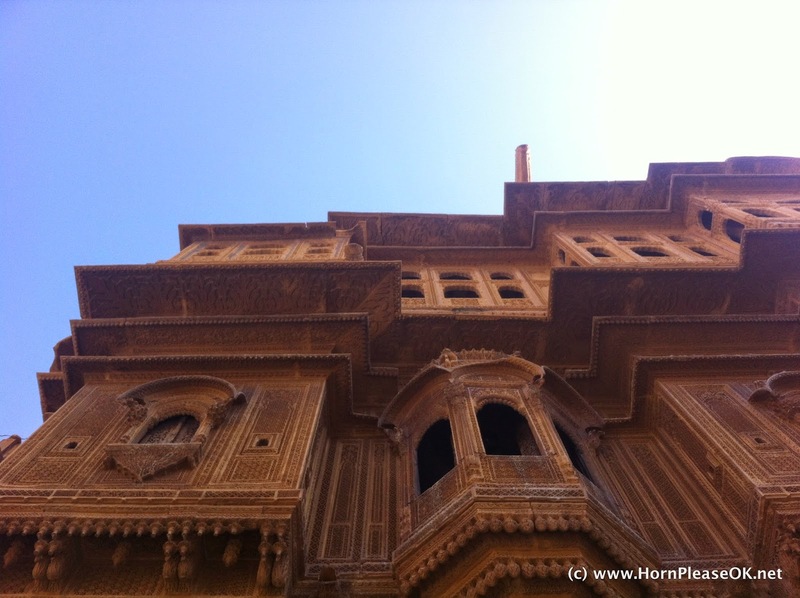 Patwon ki haveli is a cluster of 5 havelis built in the early 19th century by Guman Chand Patwa. One for each son. While the family's (their actual name was Bafna) legit business was in gold, silver and textiles rumour has it that they ran a parallel business of trading in opium. The floors above ground were used for legit business dealings while the contraband substance was stored in the basement. 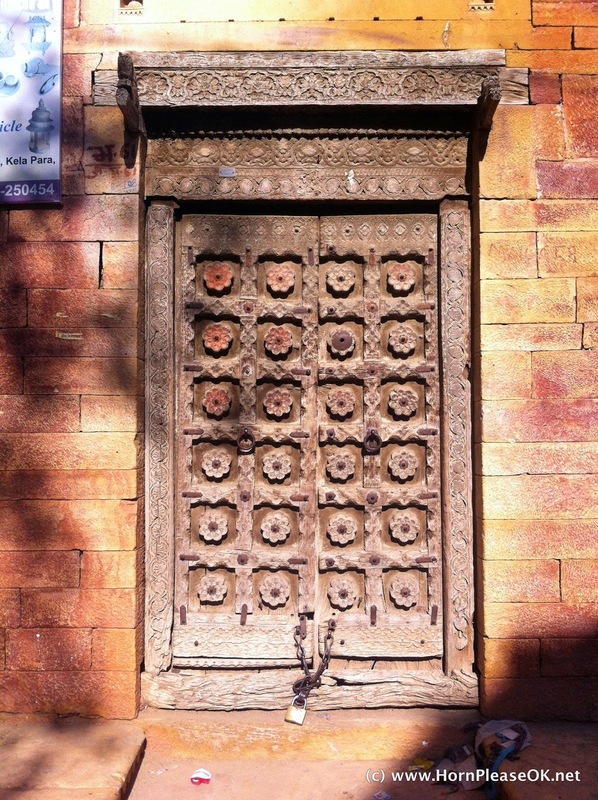 Two of the havelis are now owned by the government (ASI) and another two by descendants of the Patwa family. The most ostentatious, Kothari Haveli is owned by someone who bought the haveli for a paltry Rs 60,000 twenty years ago. Its been turned into a rather gaudy museum of fairly new Rajasthani artefacts. Travel Tip: If you're short on time skip the museum inside Kothari Haveli. Nathmalji ki haveli found us before we could map it out on Google. Not surprisingly Google maps is not a reliable navigator inside the old town. Partly because of a patchy internet connection and partly because its just asking for too much from technology. The haveli was gifted by Maharawal Bairisal to his Diwan, Nathmal in 1885. Nathmal was said to have been overseeing the construction of a palace for the King. Being a shrewd business man he used the downtime of the workers to construct this haveli. The king happy with the Diwan's initiative and enterprising spirit, gifted him the haveli. The tiny courtyard inside is crammed with shops selling art and handicrafts and the rear section is a private residence. The intricate stone carvings on the wall made our eyes travel up towards the latticed balconies and carved pillars crowning the narrow space. Our hotel was inside the fort. We headed over to check in lest our host decided that we weren't going to show up and gave our rooms away. The sight of the Golden Fort will make any Feluda fan's heart beat faster. And now you know how it got its name. It is made entirely of yellow sandstone found locally. Built nearly 1000 years ago in the 12th century by Maharawal Jaisal, the fort is built on the highest point in Jaisalmer, Trikuta hill. The foundation of the fort is made of a single slab of stone. Cars aren't allowed inside. We left ours parked along the fort wall with a gazillion others. There was an autorickshaw waiting to receive us and we piled in luggage and all. 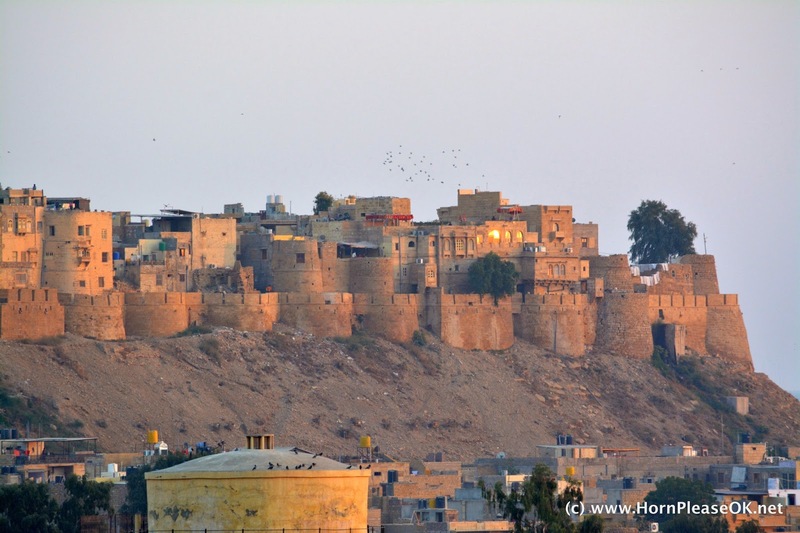 The Golden Fort is famous for many things, one among them is that its the only living fort in India. 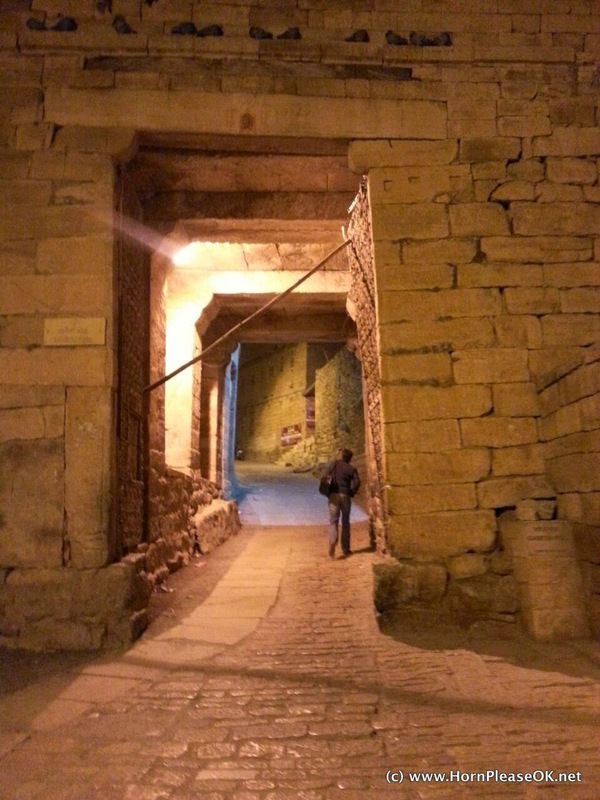 Its 99 bastions and 5 km long fort wall are riddled with pigeon hole like hotels, houses and shops. Narrow lanes flanked by open ditches and cables running higgledy piggledy from precariously standing electrical poles. A new temple hugging the walls of an old one. An ornate palace towering over a defunct well with a rusted pulley. Men urinating, children playing badminton and scooters zipping around narrowly missing pedestrians. We were booked into Hotel Victoria, a cute little hole in the (fort) wall with an endless supply of tea and mineral water, both of which we were grateful for. Travel Tip: There's a big debate on about whether tourists should stay inside the fort. While it gives you an authentic experience, the fort's insufficient infrastructure is visibly under strain. Choosing to stay outside the fort is the more responsible choice - one we should've made. The sun was getting ready to set. 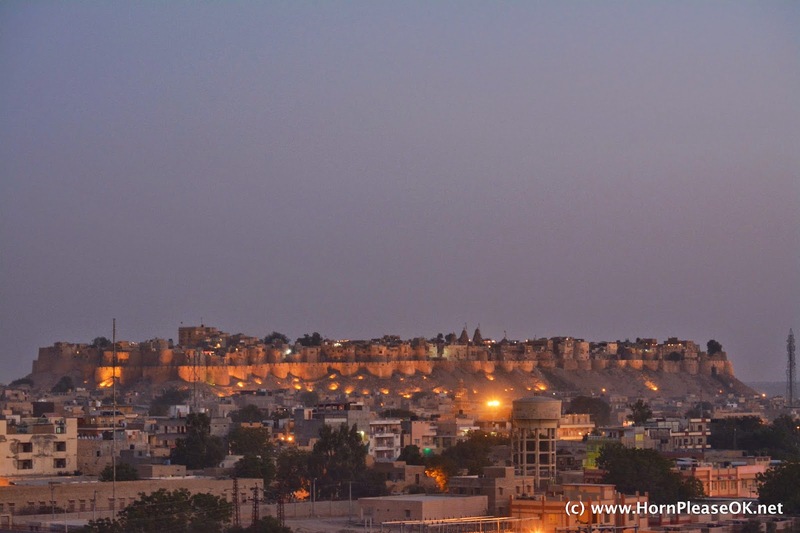 With just 1 night in Jaisalmer, this was our only chance to catch the fort bathed in the glow of a desert sunset. Pankaj our friendly host suggested we go to the Vyaas Chattris for a good view. 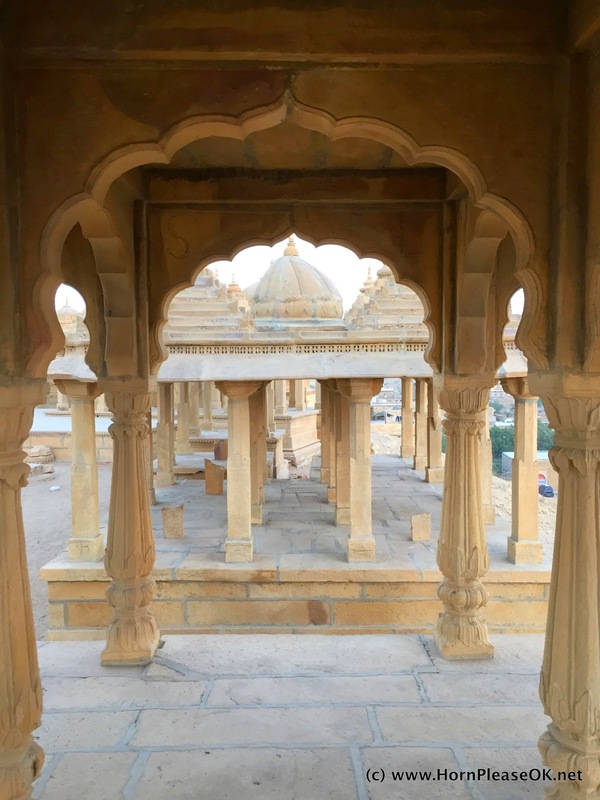 The Vyaas Chattris are cenotaphs built for the Brahmin community of Jaisalmer. Cenotaphs as we'd discovered are memorials built for kings and other important people. In some cases its where the last rites were carried out. Hauntingly beautiful, cenotaphs today mostly serve an ornamental purpose. We bought our tickets at the gate and walked towards the Chattris to find a smouldering pile of wood. Had we just walked into a cremation ground? There were plenty of people around us acting normal, taking pictures and generally not freaking out. We took comfort in their oblivion and hurried over to sunset point a few metres away. The sun cast its golden light on the fort sending everyone into a photo-clicking frenzy. It was almost picture perfect except for the smog that creeped into the frame. We were so intent on taking pictures that we didn't notice the crowds thin out or hear the security guard blow his whistle. Evening had turned into dusk and we were the only ones left at the cenotaphs with the still smouldering pyre. We ran to the gate and discovered that we'd been locked in! A few panic stricken minutes of yelling and jangling the gate ensued. It quickly became clear that we'd have to try something else. One of us spotted a section of low wall next to the gate and found a stone to help us climb. We hoisted each other up over it landing in a pile of garbage on the other side. It was both funny and a little scary but its what you need to be prepared for when you go looking for adventure. Travel Tip: If you're visiting Vyaas Chattris close to sunset, don't get caught up in the beauty of the place and forget to get out before the gates close. I really like that pic between those two walls!